Pycnogenol benefits skin health and beauty in scientifically proven ways. You get the most pronounced positive effects when you combine taking it orally with transdermal (applying as a cream, for example). Always make sure you get the real French Maritime Pine Bark Extract made by Horphag, and not the cheap, unproven imitation products out there. 1 - It binds with elastin and collagen, which are primary proteins of skin. This provides protection from certain enzymes that damage and weaken skin. 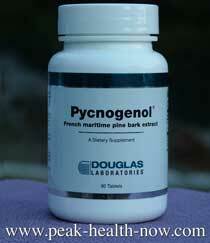 Pycnogenol is drawn to an amino acid called hydroxy-proline, that is part of the collagen and elastin matrix. It protects these proteins from free radical damage. As you may know, aging of skin is characterized by collagen matrix breakdown; Pycnogenol benefits skin by preventing that. 2 - French Maritime Pine Bark Extract is research proven to enhance collagen synthesis. This means it promotes collagen building, strenthening not only skin, but ALL tissues comprised of collagen and elastin - virtually every organ and body system. 3 - It also increased natural production of hyaluronic acid, increasing tissue elasticity. 4 - Pycnogenol benefits skin in yet another way; it enhances Nitric Oxide (NO) production. NO is a vasodilator which relaxes blood vessels, improving blood flow. The result is increased blood perfusion and oxygen supply throughout the body including skin. Greater blood flow and oxygen in skin gives optimal nutrients to the tissues as well as improving healing of wounds. Optimally nourished tissues are healthier, stronger, more disease-resistant and more beautiful.